If you don't know Kristen from Kristen's Custom Creations, you must meet her! She is a beautiful woman inside and out, she has a darling son, and she makes the most incredible jewelry around! I own a beautiful piece of her work, and have purchased many necklaces for family and friends. Check them out! Everytime she introduces new pieces, it astounds me, her talent is limitless! In a tribute to mothers, grandmothers, aunts, sisters, and friends, Kristen has teamed up with me to offer an amazing giveaway at my review site, Therapeutic. Head over to Therapeutic and enter the You Design the Necklace Contest and Giveaway. 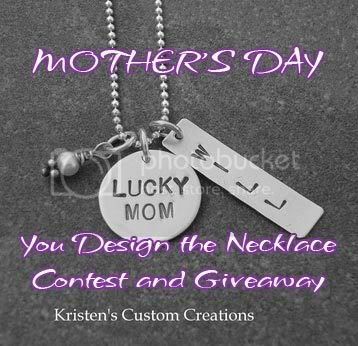 The winning fabulous idea will be created by Kristen and awarded to the designer as a Mother's Day gift!! Do you feel creative?! Would you love to see your work translated into art? Walk...no...RUN over and enter...there are up to 10 possible chances to win! You know I'm so there...I've just got to get my creative juices flowing! I am so not creative, but I will have to check it out. Although I know that being a daddy blogger means that even if I enter, and if my name is pulled, that slip of paper is going right back in the hat. Oh how cool, I will have to check her site out for sure. I have been trying to brainstorm some good mother's day gifts. Thanks for the tip! Ohh - I love her stuff. I'm on my way!